Just look at that sweet face - Ollie is an awesome dog ready to find his furever home. Read all about how to adopt him right here. Ollie is ready to to become your furever friend. Calling all Retriever fans- please allow me to introduce you to Ollie. 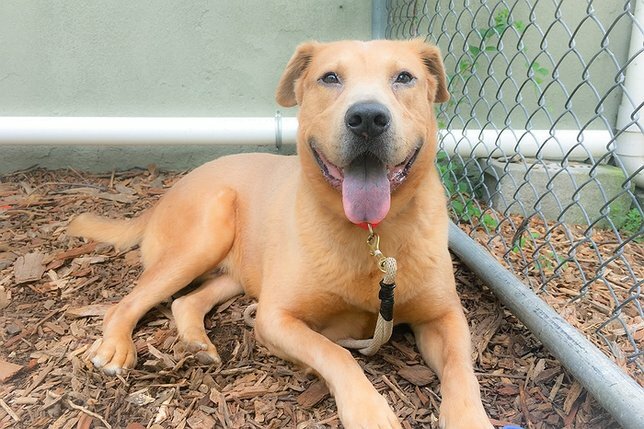 Ollie is a 2 1/2 year old neutered retriever mix who made his way to the Town of Hempstead Animal Shelter. After being found running loose on the streets near Hofstra. Ollie show signs of being neurological- while he tends to walk with a gait which increases when he becomes excited, this condition does not hold him back, that is for sure. Ollie is a wonderfully loving, silly, sweet, playful boy who deserves so much to be with people who are going to love him and care for him. Ollie is house trained, and friendly with dogs. Please consider bringing this special needs boy into your home and your heart. Please call for more information: 516-785-5220 or come visit us at: 3320 Beltagh Avenue, Wantagh NY 11793. As always, please remember to always adopt, never shop...pass it on! Get Your Hot Dogs Here! Check Out This Week's Adorable Adoptables!! This Week's Adorable Adoptables: Meet Lucas and Flamingo! Subject: LongIsland.com - Your Name sent you Article details of "Adorable Ollie is Ready to be Today's Adorable Adoptable"